Cold cathode neon and low voltage lighting are very important themes of light for use in the urban context whether for interior use in shopping centres, offices, cars or restaurants and for exterior use in dynamic methods forming large visual splashes of light across buildings and architectural features. 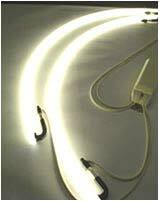 These forms of lighting can be offered on either high or low voltage to suite your requirements. Please telephone our experienced sales team, without obligation, to discuss all of your lighting needs from site survey to design, manufacture and installation with a full after sales nationwide maintenance and repair service.